Maxi Health Research® is proud to provide you with our delicious tasting Omega Yums 2000™. The fish oil is encapsulated in a kosher, vegetarian soft gel, suitable for children, which can be chewed, punctured for the oil, or swallowed whole. It easy to digest and has no aftertaste. You keep hearing and reading about the benefits of essential fats, the omega-3 fatty acids: eicosapentaenoic acid (EPA), docosahexaenoic acid (DHA). You’ve heard and read how it supports the brain, the eyes, joints, mood, memory, and heart. Remember, it’s the Omega-3’s that most children are deficient in, not Omega-6. Omega Yums 2000™ comes in in a delicious fruity burst flavor. You will want to make sure your children have this wonderful support while under your care. Don’t forget to take it for yourself while you are at it. You don't have to be a kid to like Omega Yums 2000™. Try it - you'll see! Children take two (2) to four (4) softgels; adults take three (3) to six (6) softgels daily with meals, or as directed by a healthcare practitioner. Softgels can be chewed or swallowed. *Percent Daily Values are based on a 2,000 calorie per day diet..
Other Ingredients: Gel Shell (conrstarch, carageenan, vegetable glycerin, purified water, stevia leaf extract), mixed Tocopherols, and natural fruit flavors. Contains kosher approved fish (Salmon). This product contains no soy, wheat, gluten, yeast, salt, sugar, milk, artificial colorings, flavorings, or preservatives. Our fish oil is rigorously third party tested to provide guaranteed potency, purity, and to ensure it meets or exceeds U.S. standards for contaminants such as mercury, lead, cadmium, PCB's, pesticides, and dioxins. 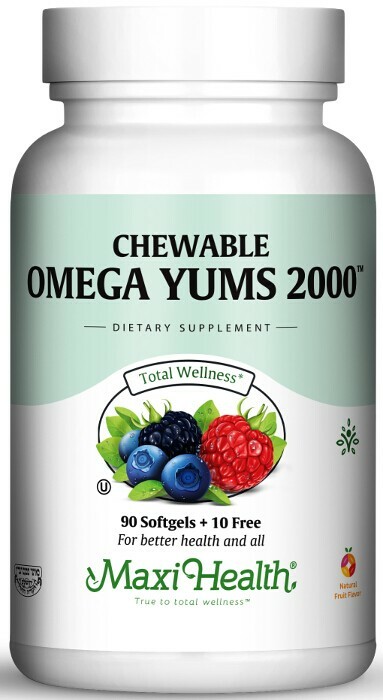 A friend told me to give my son who was suffering from bed wedding a daily dose of omega-3, and she was amazed with the results of Omega yums 2000.